The installation of OpenWrt firmware is device specific. These device specific procedures should be found in the OpenWrt wiki. See OpenWrt Table of Hardware for available procedures. If your device is not listed, information on this page may be helpful. Please reset board to factory settings to avoid problems with some previous configuration. Connect your computer to the board. In the address bar of the web browser, enter 192.168.1.1 and login using ADMIN as username and blank password. Go to Management section and choose Firmware Upgrade. Press on Browse and choose file already downloaded to your computer. Press on Apply button to commence the firmware upgrade. The firmware upgrade procedure can take few minutes. After that you will need to reconnect LAN cable or to Disable/Enable NIC card in order to get new valid IP address in 192.168.45.x range from router. Do not power off the router during the firmware upgrade, as it can cause the device to crash or become unusable. If OpenWRT firmware was previously installed on your router, be sure and disable Keep settings option during firmware upgrade. Press Login button to access to Status tab. 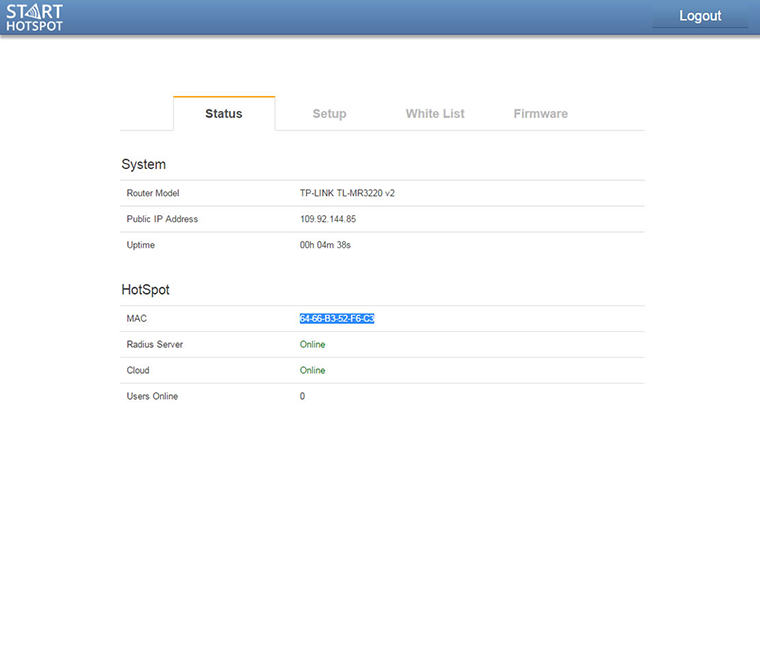 On Status page you will see a MAC address of your OpenWRT router which will be used in the SignUp process. After selecting your HotSpot name, select as HotSpot model OpenWRT, and add your MAC address from Status tab. 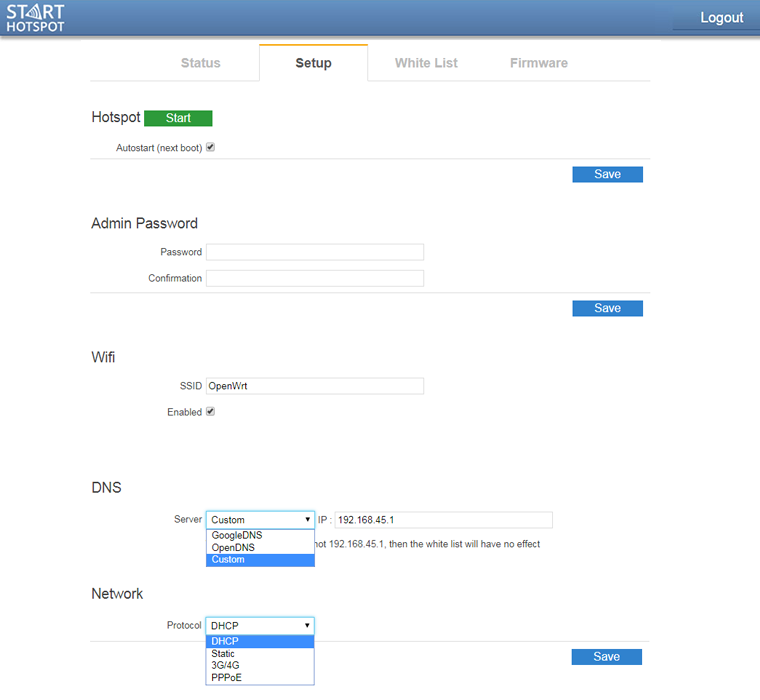 From Setup page configure your OpenWRT router. Be sure and set Autostart option. This option is not active by default. 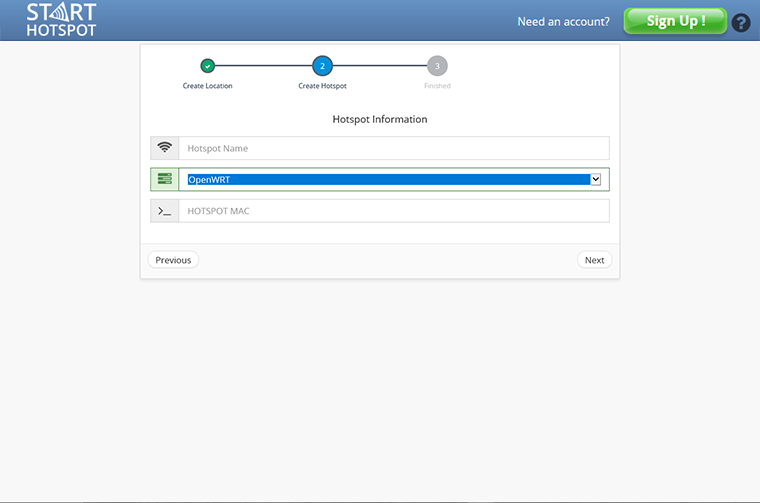 Here you can set new Administrator password for access to the router setup and configuration. Save changes. Enable WiFi, set SSID name and click Save. Please note, if the DNS IP address isn't 192.168.45.1, the whitelist will have no effect. By default as Network Protocol is set DHCP, but you can choose Network Protocol based on your needs. Our recommendation is to use DHCP Network Protocol. When you finish setup, restart router to apply changes. If you need help with configuration, please go to starthotspot.com and contact our tech support. We'll be glad to help you.